What are the best Pillows for Sleepers with Shoulder Pain? Any pain around the shoulders may be caused or aggravated more if your sleeping position leaves your shoulders in an awkward position. The pillow you use may cause it or if your mattress sinks you too low into the bed. This problem can be fixed simply by finding the right pillow or mattress. If the cause of your shoulder pain is the pillow, it may be because you are a side sleeper and you’re using the wrong pillow. Side sleepers are very prone to having sore arms, shoulders, and neck in the morning because the pillow they use does not provide enough support to align the neck with the spine. There are very specific types of pillows for side sleepers that give the right support while still being very comfortable. If you aren’t sure of what the best pillows are for shoulder pain, read through this article. How to find the best pillow for sleepers shoulder pain? The key to avoiding shoulder pain when sleeping is to try and avoid scrunching your shoulders together when you sleep. Of course, this is almost impossible to do when you are asleep because you can’t control your muscles unconsciously. However, there are ways to keep your shoulders open, such as wedging a sturdy pillow between your arms while you are sleeping sideways. A firm pillow will retain its shape and will prevent your shoulders to collapse through it. Not only does it help your shoulders but also your neck and your back. If you don’t feel like hugging a pillow, or you would much rather cuddle with your partner, you need a pillow for your head that has neck and shoulder support. Pillows that are capable of supporting the neck is the best because it reduces the shoulders from moving to unnatural positions when you sleep. Don’t pick pillows that are too soft because your head will sink into it, giving your neck and shoulders more pressure, which causes pain. Key Takeaway: Shoulder pain is often caused by neck pain. The best way to avoid having shoulder pains is to stabilize the neck during sleep by allowing it to naturally align to the spine. The only way to do this, especially if you are a side sleeper, is to find a pillow that comes with neck and shoulder support. The best ones are memory foams that mold to the natural shape of your head, neck, and shoulders. What are the best pillows to alleviate shoulder pain? This memory foam pillow is able to cradle the head and neck to remove any pressure around the shoulders and back. It effectively contours to the body contours even if you change positions all night. The memory foam is housed in a better than down cover that is hypoallergenic and made of 100% cotton. There’s also a feature called BioSense core allows air to flow easily to adapt to your body’s temperature. Despite being compact, the memory foam has a perforated ventilated design to allow air circulation. The only con for this pillow is the high price. The good thing is that the manufacturer offers a one-year warranty for this product to ensure that it lasts. You don’t have to worry about the memory foam sinking early, no matter how much you use it because it is definitely built to last.  PILLOWS FOR SLEEPING - Sleep comfortably with proper neck curve alignment. Helps military neck and improves neck posture. Sleep on your side or back. PILLOWS THAT HELP SUPPORT YOUR NECK - Best neck stretcher: Lay on the traction v side on your back. Provides ergonomic support for the back sleeper. This pillow is very different to the traditional pillows or memory foam ones because of its unique shape. This is specialized for sleepers that really have neck, shoulder, and back problems. If you are feeling pains in these areas or want to prevent having them, then this pillow is definitely worth trying. This pillow has a cervical linear traction that has an inward curved shape in the middle to cradle the head while a V-shape protrusion supports the neck and shoulders. Whether you are sleeping in your back or sideways, this pillow can hold your neck and head to prevent it from falling into awkward positions. It allows your head, neck, and spine to align perfectly, minimizing or removing the pain felt in the morning. Not to mention, this pillow can also result to an improved posture. It is stuffed with high quality polyester fiber that is hypoallergenic. The pillow is covered in 100% cotton. Only downside is that new users may experience mild soreness for the first few nights. MEMORY FOAM: Cooling memory foam facilitates air flow to keep you comfortable all night long. COMFORT & SUPPORT: The ergonomic shape and cradling memory foam promote proper spinal alignment and provide support throughout the night to help reduce pain and stiffness. 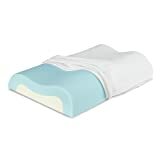 This memory foam pillow has a unique shape that allows the head to rest comfortably while the neck is cradled to align with the spine, reducing stiffness and numbness in the morning. The soft foam retains its firm shape while supporting the natural contours of the head, neck, and shoulders. Found on the upper layer is a cooling memory foam that ensures air passes through to keep a comfortable sleeping temperature. The two-layer foam are both sturdy built to ensure that it won’t flatten anytime soon. To prove this, the manufacturer even gave it a five-year warranty. For something at this price, there’s really nothing to lose. The design of this pillow is not your usual; it has a high loft and a low loft that allows you to choose the most comfortable position and support for your neck. The SureTemp memory foam responds to your body weight and effectively molds to the shape of your head for ultimate comfort. The foam is housed in a removable and machine-washable cover made of cotton. You can also choose the feel of your pillow: medium or medium-firm and comes in two sizes: queen and standard. You don’t need to spend too much in therapy when you can solve shoulder pains by buying the right pillow. Before trying any expensive therapies, medications, and exercises, simply look first on how you sleep and try to change your mattress and pillow. You’ll be surprised when you find out that the right pillow makes a difference. The best pillows for shoulder pain aren’t difficult to find. All you have to do is search for pillows that contours and supports both neck and shoulder.